We’re very proud of the great team that enables us to adapt and grow year after year. Mouse over below to get to know us better. Has rejoined the company after spending four years at Appalachian State University. I am not sure what exactly he did for those years but suffice to say he did graduate in four years with a degree in psychology and business. The business degree should help in our company and from what I understand the psychology part is so that he can put his Daddy on a couch and see what makes him tick. This young man has an outstanding personality which we hope will help with our customers and their needs. After two years in the sales department, Bryan spent a year in the growing department trying to understand how plants grow. 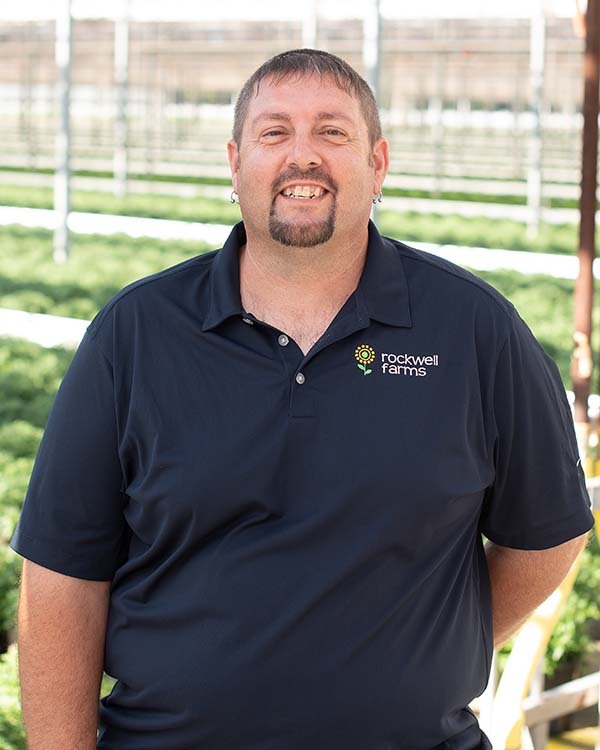 Bryan’s latest transition to the Operations Management team is an exciting endeavor for both Bryan and Rockwell Farms. 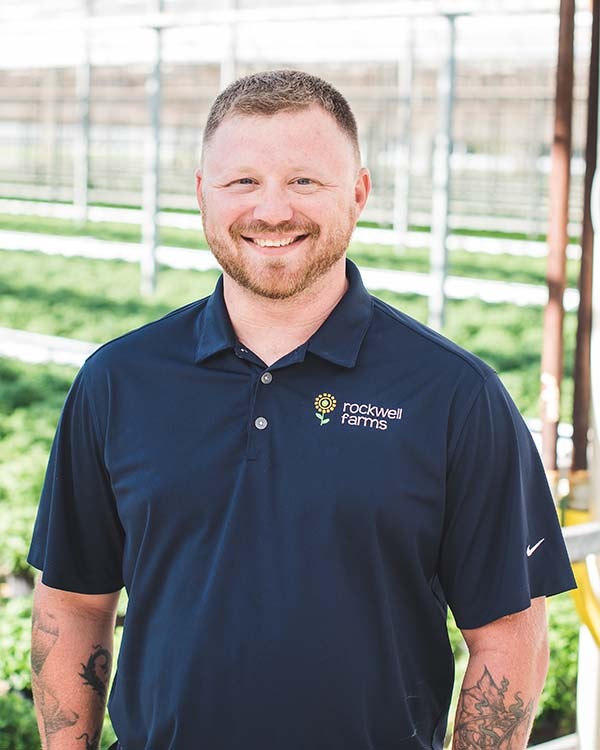 As of December 2017, Bryan became a Co-Owner at Rockwell Farms. He and Jason will be running the company upon Tom’s eventual retirement (both are hoping this will happen soon). 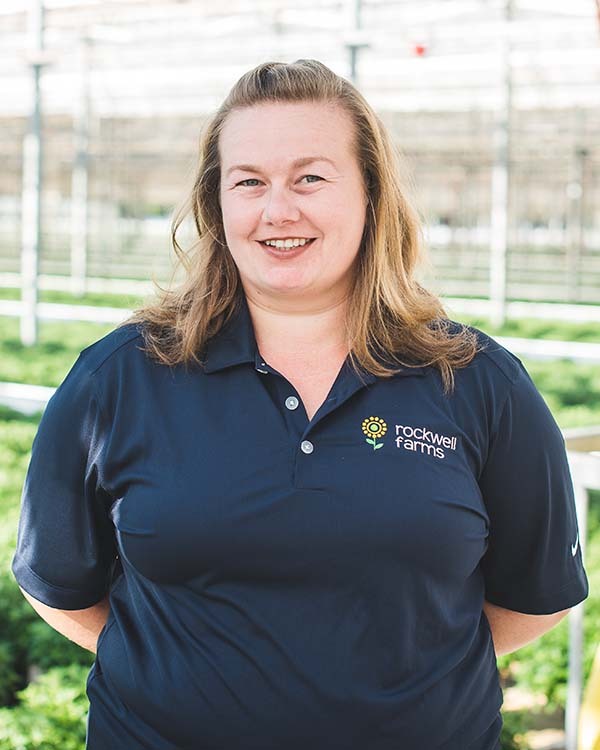 Is our head grower, she came to Rockwell Farms in 1997 as an exchange student from Bulgaria. Through dedication, intuitive talents and the desire to grow the "great plant," she has risen to the top of her profession. What an asset she is to our company! Started with us in April 2003 as an intern from Bulgaria where she attained a degree in horticulture/business management. The enthusiasm that she shows for her job is totally unbelievable. She is our shipping coordinator and team lead supervisor. She helps lead eight team leads and about forty people. Trying to keep all these balls in the air is one very difficult job, but Nena is capable and leads with true enthusiasm. Michael is our leader in the Logistics department. Routing and dispatching trucks, hiring dependable and qualified drivers, and delivering products on time is an extremely tough and tedious task. Michael has excelled in this role since 2001. In 2013, Michael added production forecasting responsibilities to his primary roles. This is a very complex job but with Michael’s knowledge of our ERP software he can handle this flawlessly. Sometimes you can look in his office and notice a far off look on Michael’s face and you know he is finding a solution to another complex situation. HQ joined to us from Yunnan Province, China in 2010 on a one-year student internship to learn modern growing techniques. HQ eventually returned to the USA in 2013 as an assistant grower and was promoted to a section grower in 2014. She has an amazing eye for detail and effectively grows quality plants to meet our tight shipping windows. He has made the transition into our maintenance department to help relieve some of the burden from Scott and Vic. What a great job he has done! Learning everything from scratch, he has progressed to a great level. She joined us in 2017 and rapidly assumed all accounts receivables, accounts payables, and administrative details. Always with a smiling demeanor, she earned the nickname, SA (“Sweet Anna’) from our President. Anna’s hard work and positive attitude have made her a key contributor to our team. In her spare time, she and her spouse raise and manage a great quantity of honey bees. A very interesting diversion. 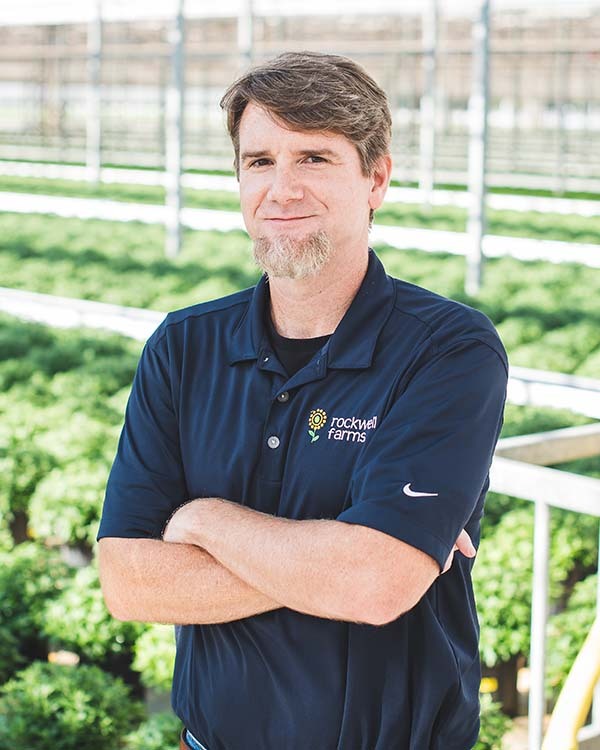 Joined us in the spring of 2006 as a production supervisor in our planting department after graduating from the University of North Carolina at Chapel Hill. After doing such a great job for us, he indicated that he would enjoy trying to use some of his skills in the sales department. After doing a stint as a junior salesperson he took on the added responsibilities in our accounting department. In mid-2010 we moved him to head the sales for our company. This was quite a fortuitous move because he has performed great and is moving us to new levels within the marketplace. Slava begin his career at Rockwell Farms as an intern in 2001. He studied horticulture in his native country of Moldova (small country in Eastern Europe) and earned B.S. and Master’s degree in Horticulture from the Agriculture University of Moldova. After completing internships in Poland and Holland, he has made his home in North Carolina. In the summer of 2015 Slava transitioned to a new role, Assistant Operations Manager. He is learning fast and developing skills that will reward us for years to come. Began working on our greenhouses in the early 80s when he would help his dad, Bobby, with the electrical and mechanical in the greenhouse. Over the years we have watched Scott grow and mature. When his Dad left to do missionary work in Haiti and Honduras, Scott became our maintenance lead & go-to guy. His knowledge of environmental control systems and electrical systems is unmatched. We constantly lean on him to figure out and correct the things we have messed up. He always finds the solution. Scott, in his unassuming ways, gets the job done. Is the guru of the farm? We think that he would be most happy as a Trappist Monk or sitting on the mountain contemplating the meaning of things. To fulfill this mission of his, he has traveled to China to see how things are done there. To sit and visit with Mark is always enlightening and fun. 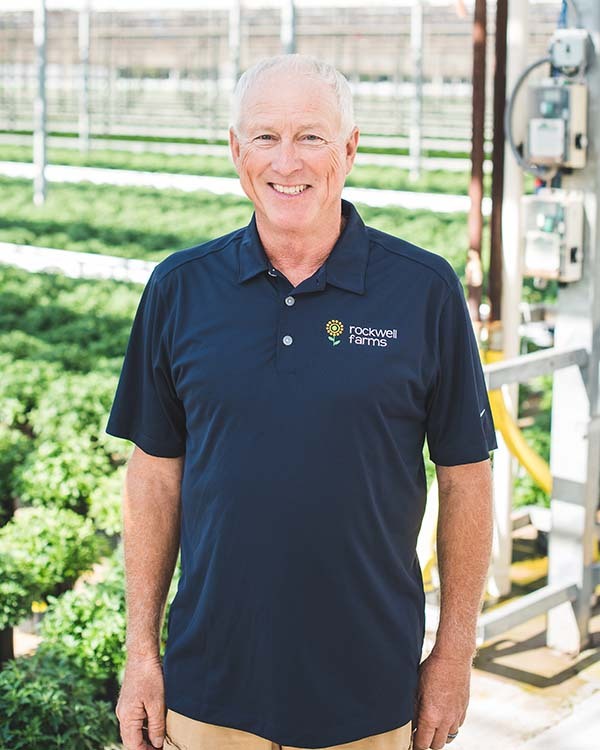 He joined our staff in 1998 after leaving the frigid north where he was a grower and garden center manager. Over the years, Mark has tackled a variety of tasks within the organization. His current responsibilities as a sweeper operator and in inventory management are important contributions to our success. Mark ROCKS! She began her career at Rockwell Farms as an intern from Ukraine. 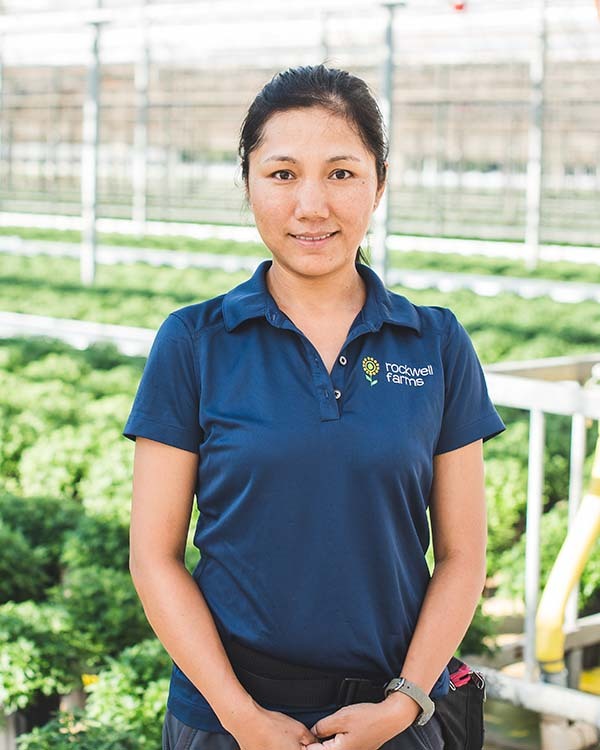 After spending time in various positions with the Growing Department, she now manages young plant production. This area is vital to our success and Tetyana is managing it at a high level. After graduating from Appalachian State with a biology degree, Will set off to find the pleasures in Tahoe and the love of California. After working for the National Parks Service, Will decided to move back to North Carolina to become a teacher. When this was not satisfying, he looked to us for a grower position. 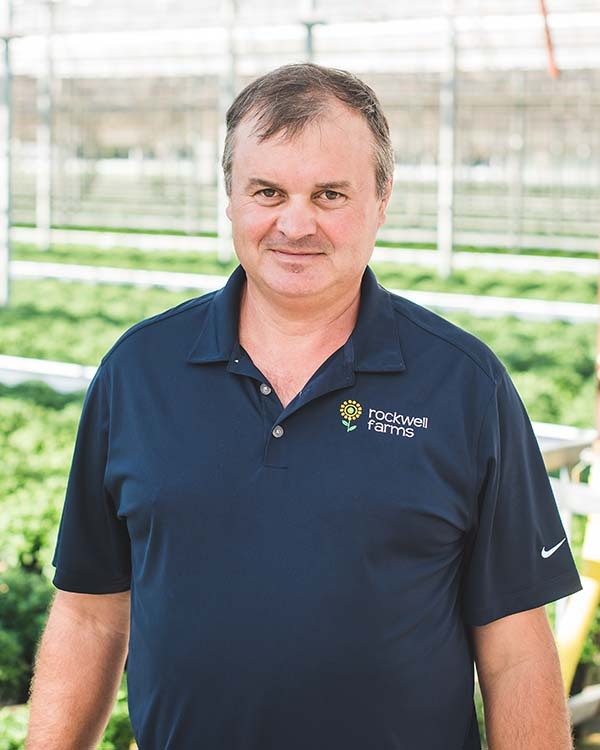 He has made rapid improvements and currently manages four acres of production. He is one of our maintenance men, but more than that, he is a key contributor in our construction & automation upgrades. Vic, who lives on the property, is always there for us on the cool nights and takes charge of our heating system at critical moments. Vic is a great asset to our team and we are lucky to have him. We’re very proud of the great team that enables us to adapt and grow year after year. Tap on a name below to get to know us better. Bryan has rejoined the company after spending four years at Appalachian State University. I am not sure what exactly he did for those years but suffice to say he did graduate in four years with a degree in psychology and business. The business degree should help in our company and from what I understand the psychology part is so that he can put his Daddy on a couch and see what makes him tick. This young man has an outstanding personality which we hope will help with our customers and their needs. After two years in the sales department, Bryan spent a year in the growing department trying to understand how plants grow. 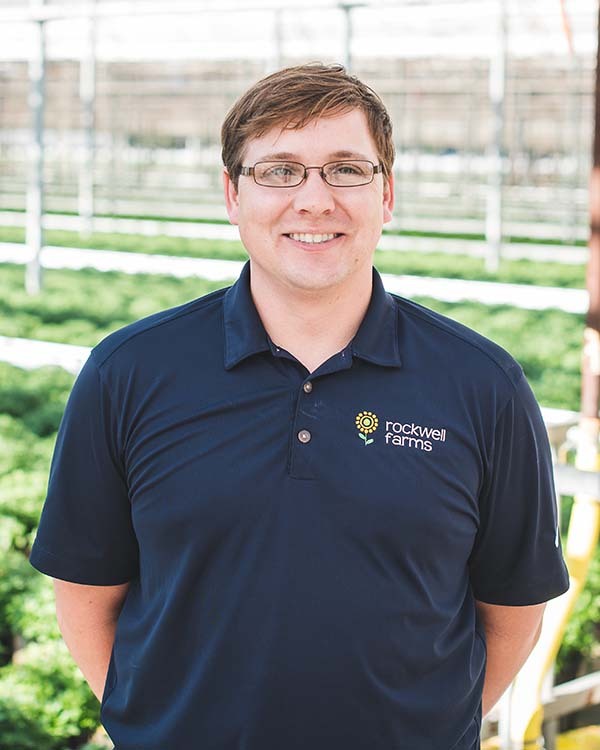 Bryan’s latest transition to the Operations Management team is an exciting endeavor for both Bryan and Rockwell Farms. 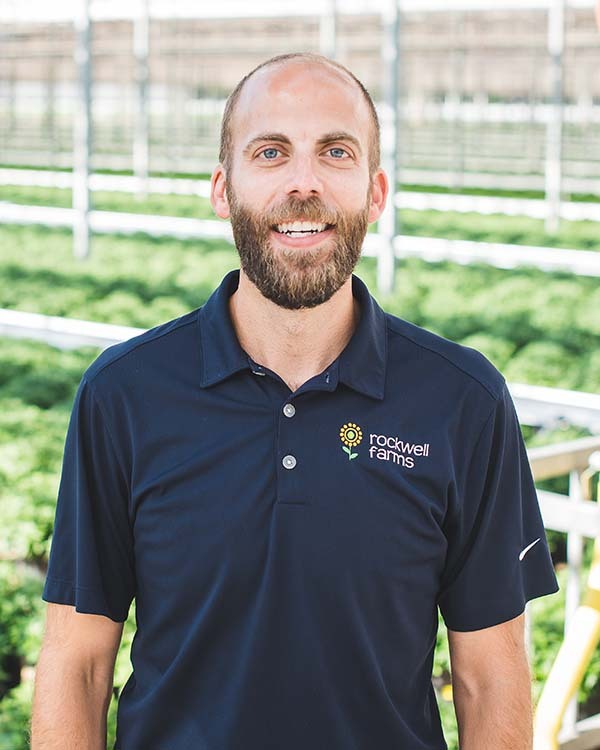 As of December 2017, Bryan became a Co-Owner at Rockwell Farms. He and Jason will be running the company upon Tom’s eventual retirement (both are hoping this will happen soon). 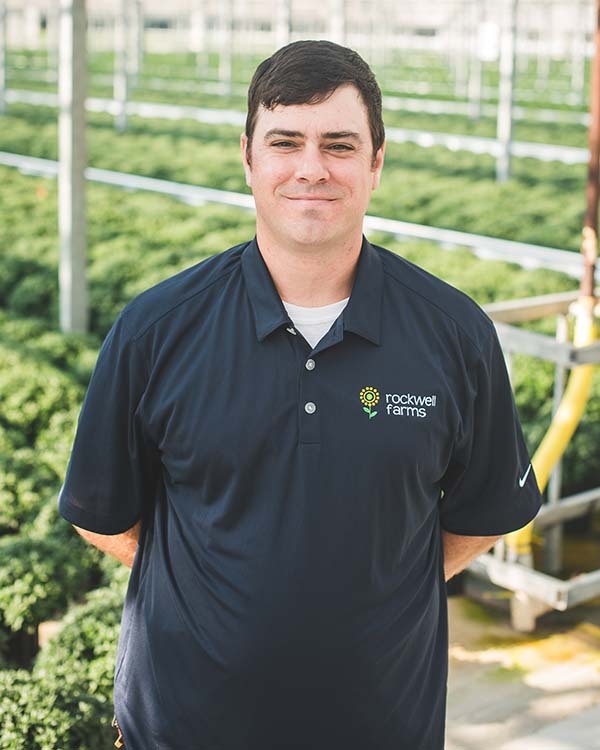 Jason joined us in the spring of 2006 as a production supervisor in our planting department after graduating from the University of North Carolina at Chapel Hill. After doing such a great job for us, he indicated that he would enjoy trying to use some of his skills in the sales department. After doing a stint as a junior salesperson he took on the added responsibilities in our accounting department. In mid-2010 we moved him to head the sales for our company. This was quite a fortuitous move because he has performed great and is moving us to new levels within the marketplace. 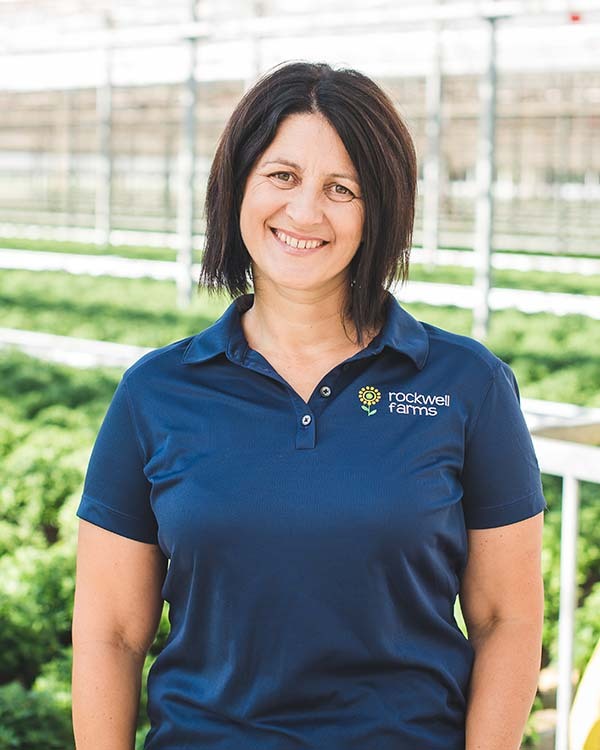 Mima is our head grower, she came to Rockwell Farms in 1997 as an exchange student from Bulgaria. Through dedication, intuitive talents and the desire to grow the “great plant,” she has risen to the top of her profession. What an asset she is to our company! Nena started with us in April 2003 as an intern from Bulgaria where she attained a degree in horticulture/business management. The enthusiasm that she shows for her job is totally unbelievable. She is our shipping coordinator and team lead supervisor. She helps lead eight team leads and about forty people. Trying to keep all these balls in the air is one very difficult job, but Nena is capable and leads with true enthusiasm. 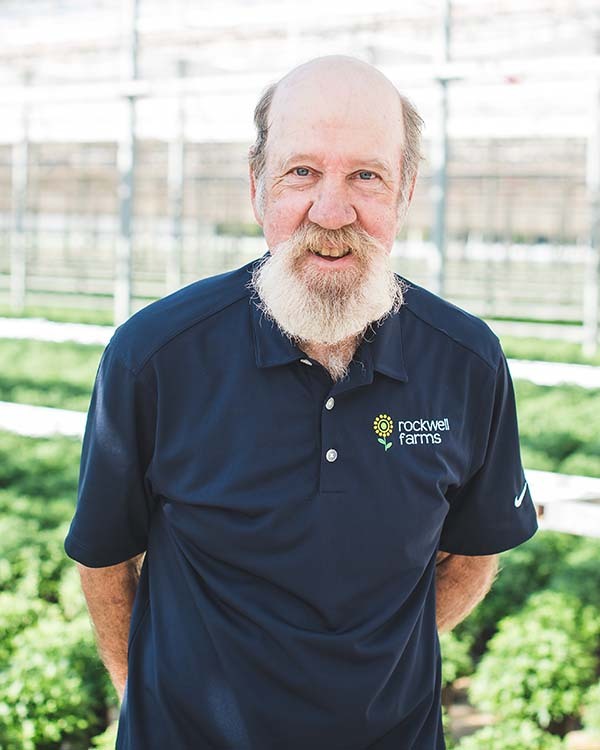 Scott began working on our greenhouses in the early 80s when he would help his dad, Bobby, with the electrical and mechanical in the greenhouse. Over the years we have watched Scott grow and mature. When his Dad left to do missionary work in Haiti and Honduras, Scott became our maintenance lead & go-to guy. His knowledge of environmental control systems and electrical systems is unmatched. We constantly lean on him to figure out and correct the things we have messed up. He always finds the solution. Scott, in his unassuming ways, gets the job done. Mark is the guru of the farm? We think that he would be most happy as a Trappist Monk or sitting on the mountain contemplating the meaning of things. To fulfill this mission of his, he has traveled to China to see how things are done there. To sit and visit with Mark is always enlightening and fun. 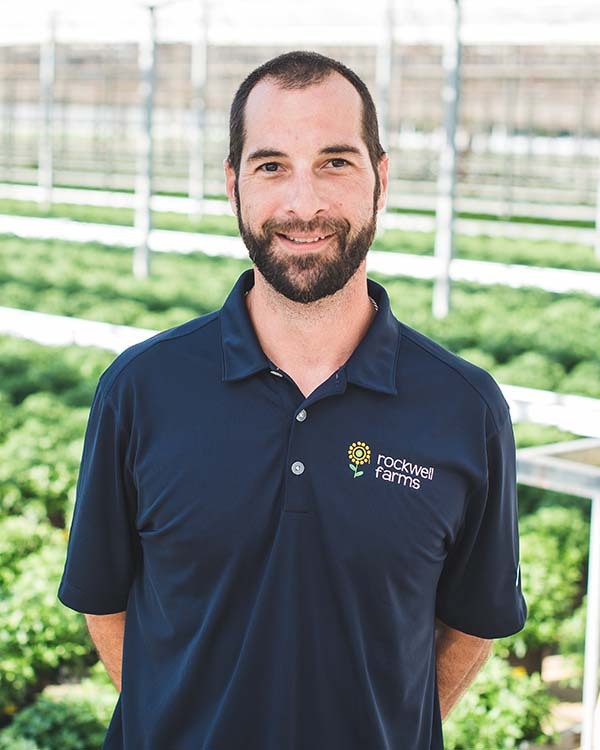 He joined our staff in 1998 after leaving the frigid north where he was a grower and garden center manager. Over the years, Mark has tackled a variety of tasks within the organization. His current responsibilities as a sweeper operator and in inventory management are important contributions to our success. Mark ROCKS! 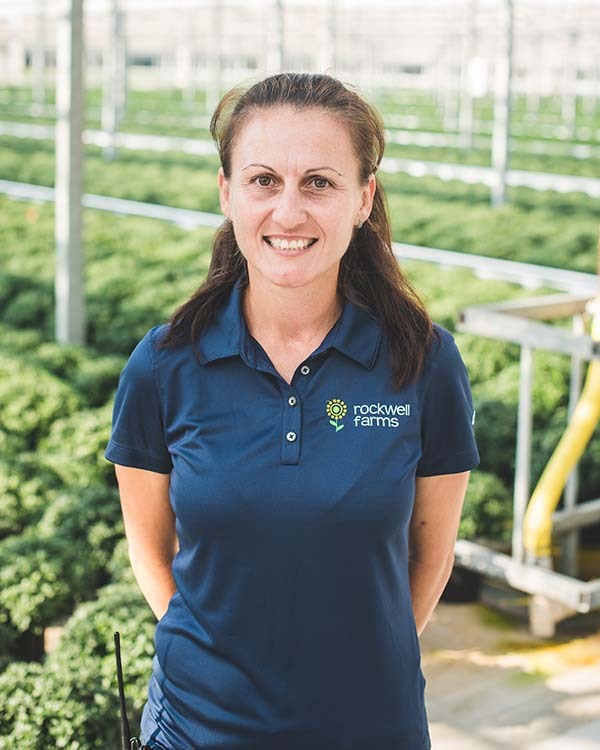 Tetyana began her career at Rockwell Farms as an intern from Ukraine. 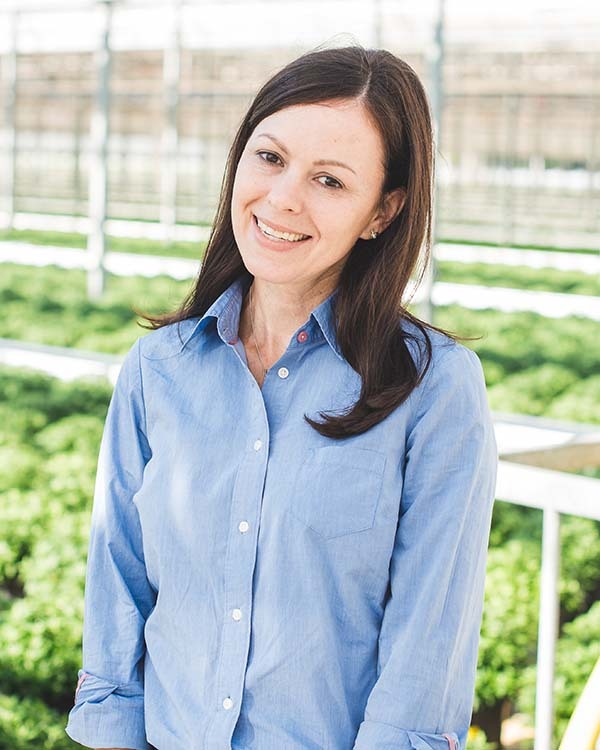 After spending time in various positions with the Growing Department, she now manages young plant production. This area is vital to our success and Tetyana is managing it at a high level. Vic is one of our maintenance men, but more than that, he is a key contributor in our construction & automation upgrades. Vic, who lives on the property, is always there for us on the cool nights and takes charge of our heating system at critical moments. Vic is a great asset to our team and we are lucky to have him. Joe has made the transition into our maintenance department to help relieve some of the burden from Scott and Vic. What a great job he has done! Learning everything from scratch, he has progressed to a great level. Anna joined us in 2017 and rapidly assumed all accounts receivables, accounts payables, and administrative details. Always with a smiling demeanor, she earned the nickname, SA (“Sweet Anna’) from our President. Anna’s hard work and positive attitude have made her a key contributor to our team. In her spare time, she and her spouse raise and manage a great quantity of honey bees. A very interesting diversion.